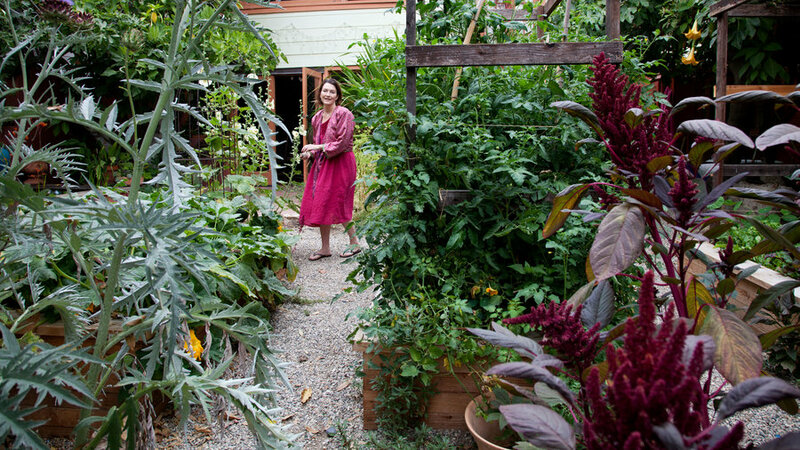 This Bay Area garden designed by Pine House Edible Gardens paves the way to the front door with bountiful garden beds. 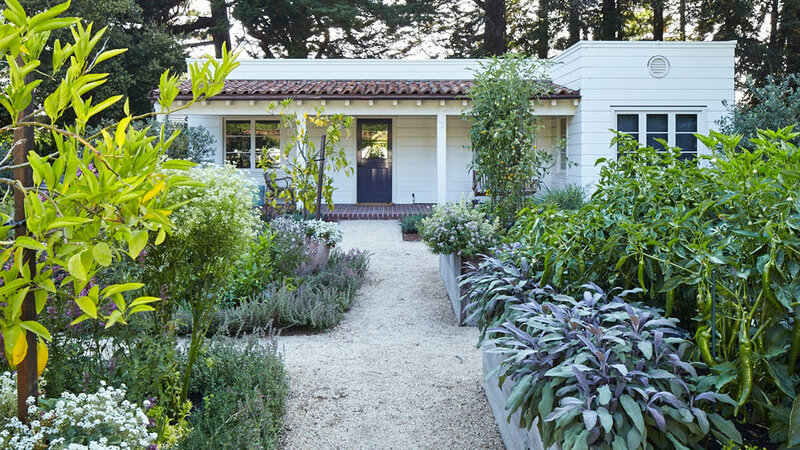 Lined with purple sage and jalapeño plants on the right with lavender and kitchen herbs clustered along the left, the entire space is stylishly contained in squared-off plots. 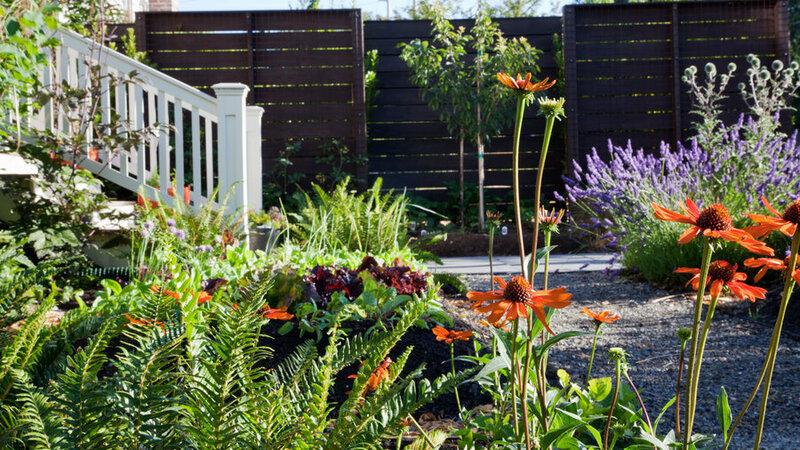 Brimming with planter beds from front to back, this yard blooms with amaranth and artichokes in the foreground, adding color to a veggie-friendly scene. As seen in Soler’s , a long planter bed can house multiple tiers of vegetables and use zucchini as a helpful yet edible groundcover. 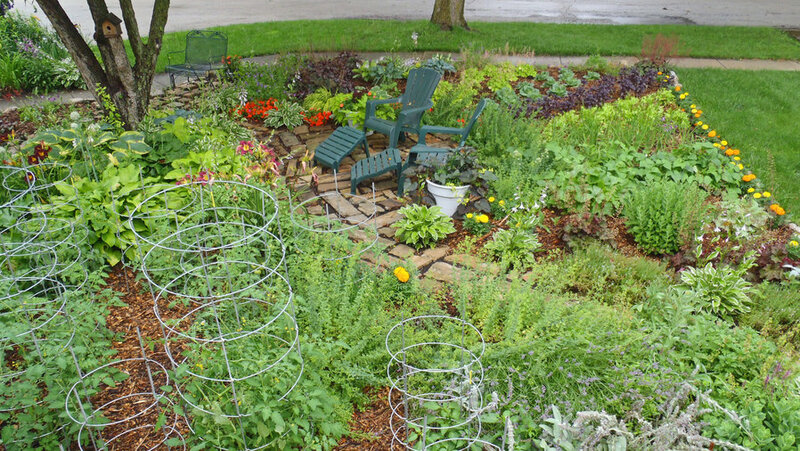 While vegetable-friendly gardens work great, edible front yards come with other options. Homeowners can stick with steady evergreens like citrus trees as Ivette Soler demonstrates here in her book, . 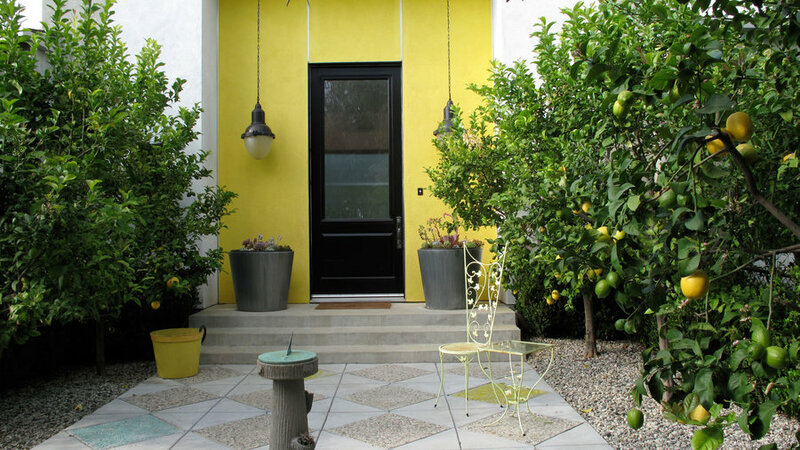 This home not only uses the citrus as a pathway border, but also serves as a subtle accent for the yellow entry wall. Ivette Soler’s offers up another view of this Seattle-based home, where the vibrant orange coneflowers add a dash of color to the nearby bed of lettuce and chard. This garden also weaves in a bit of aromatic delight with a lavender bush in the background–a crowd-pleaser for honeybees and humans alike. 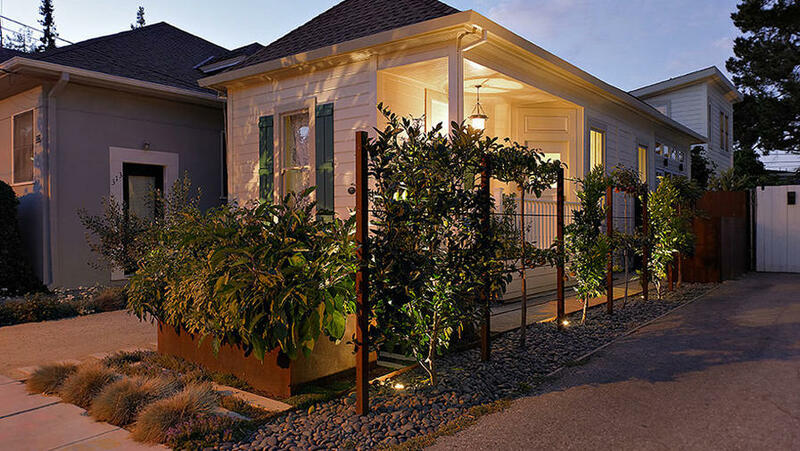 Oakland-based BaDesign created this lengthy living fence as an edible border between a Palo Alto, CA home and its neighbors. The combination includes cherry and pear trees alongside lime, mandarin, and blood orange trees. 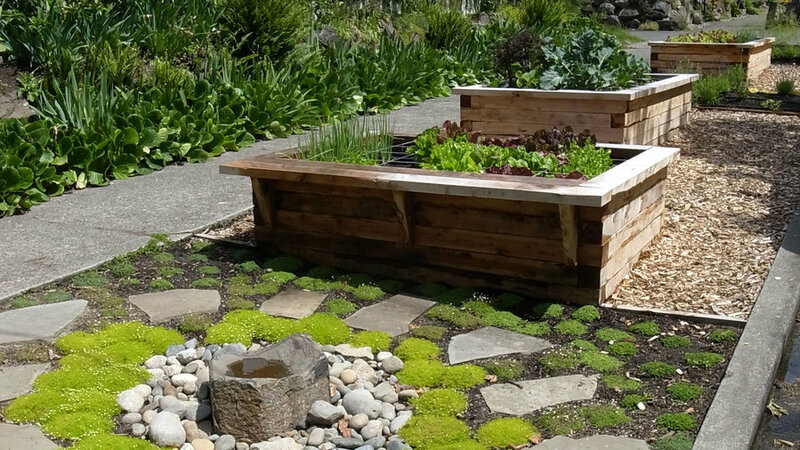 Moreover, the custom-made planter boxes are brimming with tasty kitchen treats like onions, bok choy, kale, and chard, which were chosen and installed by Pine House Edible Gardens. This edible garden uses a segment of the front yard for a multi-colored salad bar, weaving easy-to-grow annuals like lettuce with sun-bursting marigolds (Calendula officinalis). The petals offer a spicy to bitter taste and make an eye-pleasing addition to salads, soups, and spreads. 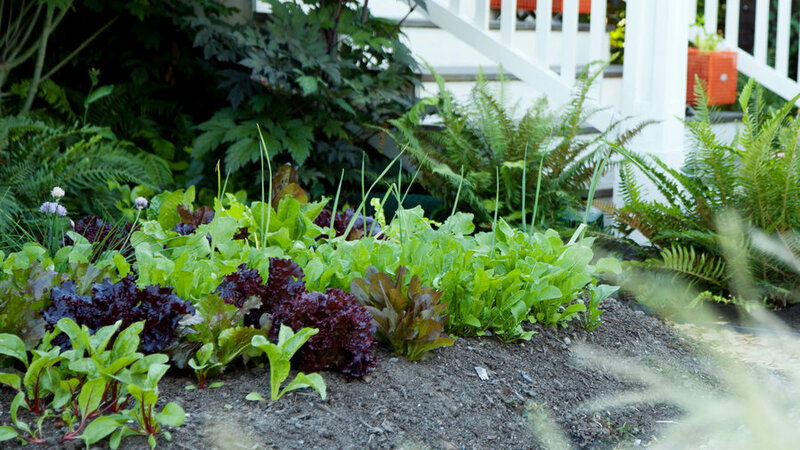 This Seattle front yard serves up a mix of lettuce, chives, collard greens, and kale. Beyond its edible function, designer Erin Lau formed a beautiful design with Bergenia crassifola and Dutch Irises (Iris x hollandica). Along the sidewalk sits a Scotch Moss (Sagina subulata 'Aurea'), Herniara glabra with Creeping Thyme (Thymus serpyllum) circling in the foreground. 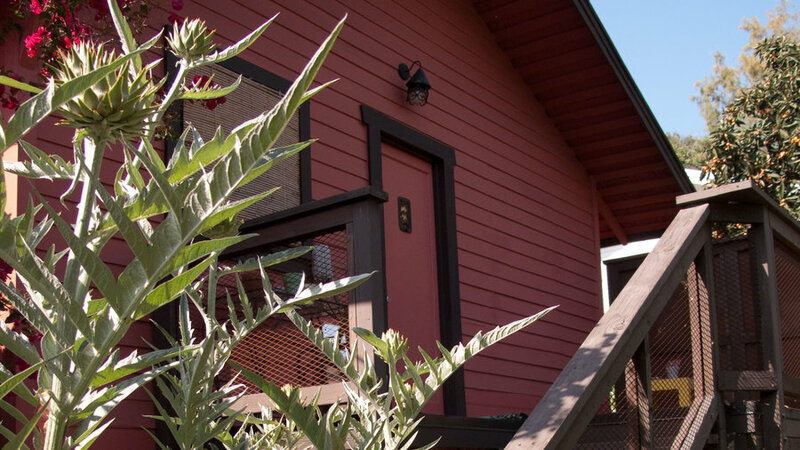 As seen in Soler’s , a Seattle-based family keeps their lettuce and chard easily accessible with a kitchen garden growing just off the front porch. 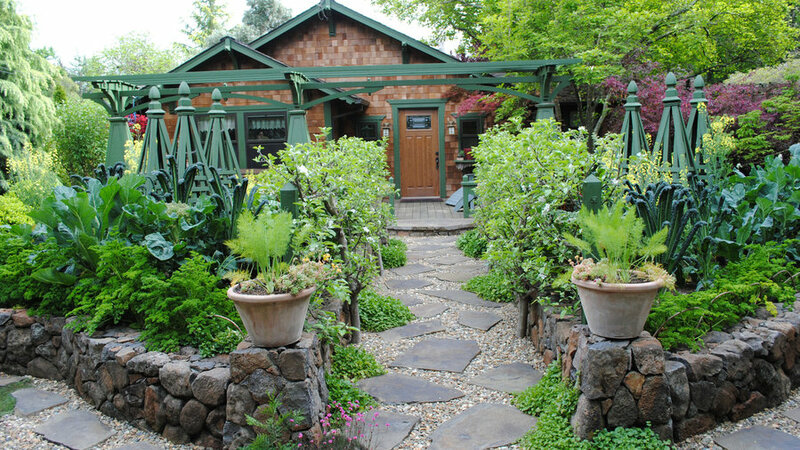 Surrounded by ferns and chives, this garden shows an easy way to incorporate edibles and ornamentals into large front yards. Both edible and perennial, these artichoke-esqe cardoons stand tall as front-yard centerpieces in Soler’s . Those interested in both edibles and ornamentals will love the bright purple strings that bloom from the plant’s center. Unlike its cousin the artichoke, you eat the stems of a cardoon instead of the flower. This lovely front yard grows kale and collards within a rock wall border as a stream of herbs trail below. An easy to grow, ever-popular vegetable, kale makes a great addition to any sun-kissed front yard as seen here in a garden featured in Soler’s The Edible Front Yard.